Wonderbook by Jeff VanderMeer, with art by Jeremy Zerfoss (and many others), is unlike any other writing instruction manual I have ever seen. Heavily illustrated with fantastical paintings and specially commissioned illustrations, it is, in VanderMeer's own words, ‘a kind of cabinet of curiosities that stimulates your imagination'. It reflects VanderMeer's own belief that ‘an organic approach to writing should be coupled with a systematic practice and testing to improve your fiction'. It is also, quite simply, a very beautiful object, gorgeous to look at, its contents by turns playful and inspirational. I may as well say now that if you are looking for a guide that sets out in very simple mechanistic terms what is required to write and publish a novel, Wonderbook is not the book for you. This is a guide to writing that is short on explanations of the nuts and bolts of grammar and how to find an agent. However, Wonderbook is a very thorough examination of the process of thinking and dreaming your way into a narrative and encourages the reader to think about creativity in a very different, and, I think, very exciting sort of way. 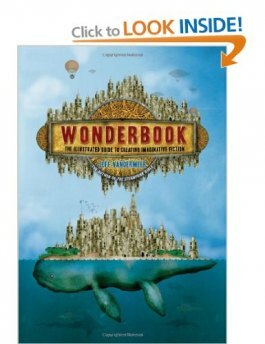 According to VanderMeer it is intended to be ‘nondenominational' in that it teaches techniques applicable to both ‘literary' and ‘commercial' fiction, but critically, although its techniques will be useful no matter what genre you might be writing in, Wonderbook's default setting is fantasy rather than realism. Given that most writing guides assume that one will be writing realistic fiction while those that offer advice about writing fantasy or science fiction tend to position it as a very different form of storytelling, Wonderbook's approach is, so far as I'm aware, utterly unique, and not a little subversive, assuming as it does, and rightly in my view, that the same storytelling skills are needed, no matter what sort of fiction you're writing. At the same time, Wonderbook reminds us that to write good fantastic literature asks the writer to be as open as possible to ideas in ways that may simply not occur to the realist writer. Wonderbook is intented to be an immersive experience, something you read from beginning to end, so is carefully constructed to offer a thorough understanding of how the elements of story actually work, more thorough than many books of theory I've encountered but also so much more fun. There are so many entertaining things to look at on each page, with a variety of unusual guides for the reader, from ‘Little Aliens' to the ‘All-Seeing Pen Eye'. But underpinning all this is good solid advice, with chapters that cover such things as ‘The Ecosystem of Story', ‘Narrative Design' and ‘Worldbuilding'. Even chapters such as ‘Characterization' and ‘Revision' take a fresh look at familiar topics. All of this is supported by contributions from an amazing range of sf and fantasy writers, including people such as Joe Abercrombie, Lauren Beukes, Michael Cisco, Karen Joy Fowler, Neil Gaiman, Ursula K Le Guin, Nnedi Okorafor and Kim Stanley Robinson, as well as analyses of work by a huge range of sf and fantasy writers, not all of them immediately familiar names but all of them excellent writers. VanderMeer also talks about his own writing practice, which will be of particular interest to anyone familiar with his Ambergris stories, but which also provides further insight into his current Southern Reach series. Added to this are writing challenges for the reader to undertake, and the book is supported by a website with further information and advice. Unsurprisingly, Wonderbook has already won awards - including the British Science Fiction Association's 2014 Award for Best Non Fiction - and is shortlisted for the World Science Fiction Convention's Hugo Award for Best Related Work, to be announced later this summer. For anyone seriously interested in writing within the field of the fantastic, this really is the one guide you cannot do without. It will open your mind to new ways of working like nothing else currently available. Publisher's website Reviewed by Maureen Kincaid Speller a reviewer, writer, editor and former librarian, is our book reviewer and also works for WritersServices as a freelance editor.